Pour hot water into mixing container. 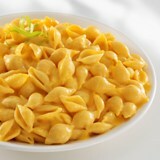 Pour contents Cheese Sauce Mix (15.5 oz) into water while vigorously stirring with a wire whisk. Continue stirring until mix is dissolved and sauce is smooth. Set aside. Place pasta in full-sized, lined hotel pan. Pour cheese sauce evenly over. Stir to combine. If pasta is cool, place in 350°F convection oven for 15 -20 minutes or until internal temperature reaches 165°F.